That image (filename: LVPLEC8F2F_Illustration2.jpg) is unavailable right now (Error code 404). An incomplete, copper-alloy Early-Medieval/Anglo-Scandinavian openwork stirrup-strap mount of Williams Class A, Type 10D. The mount is rectangular in form, with a rounded upper surface which terminates in a wide triangular apex, decorated with three rounded bosses and containing a central circular rivet hole. The rivet hole measures 4 mm in diameter. The mount has a small projecting lobe on each side halfway down its length. In each lower corner is a circular rivet hole and the flat base contains traces of a projecting flange on its reverse. One of the lower rivet holes is infilled with iron corrosion. The other measures 3.5mm in diameter. The surface is decorated with a coiled snake whose body is depicted by an openwork Urnes style roundel of interlace, sitting in the lower half of the object. There is a large head, with two triangular indented eyes centrally placed at each side. The head emerges from the body and points upwards, filling the upper part of the object. Below the snake is a centrally placed raised line running to the base of the object. One rivet hole at the base is enclosed by coiled raised tendrils. Decoration surrounding the other rivet hole is obscured by the iron corrosion however it is likely it would have been decorated in the same way. Decoration continues upwards from the rivet holes towards the apex where they move inwards, framing the head. They are linked together above the head by a union knot, before turning outwards to form rounded terminals, almost echoing the circles at the base. The reverse, which has a slightly concave surface, is undecorated with a mid brown patina and a rough surface. Iron corrosion stains the rear of the infilled rivet hole. The outer face has a dark green patina and is in good condition. Similar examples which can be found on the PAS database is LEIC-63BC32, https://finds.org.uk/database/artefacts/record/id/643631 and SWYOR-8899C6, https://finds.org.uk/database/artefacts/record/id/463212. There are only two other examples of Class A type 10D in David William's corpus neither of which was openwork. 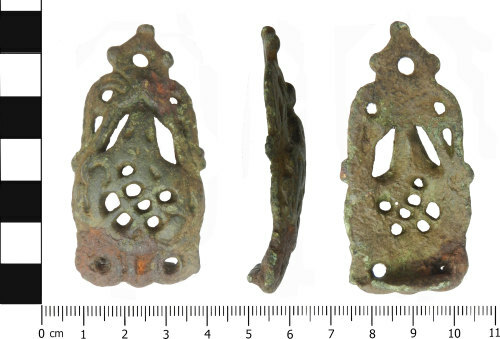 This stirrup strap mount was found in close proximity to WMID-7ABD97, https://finds.org.uk/database/artefacts/record/id/582259 an early medieval stirrup terminal, on different occasions by the same finder. There is a high probability that the finds are part of the same stirrup.